The lure for those fortunate enough to have highly appreciated company stock in their 401(k) is to pay lower taxes by utilizing what is called Net Unrealized Appreciation (NUA). To do so, it takes a triggering event: reaching age 59 ½, separating from service, becoming disabled, or death. 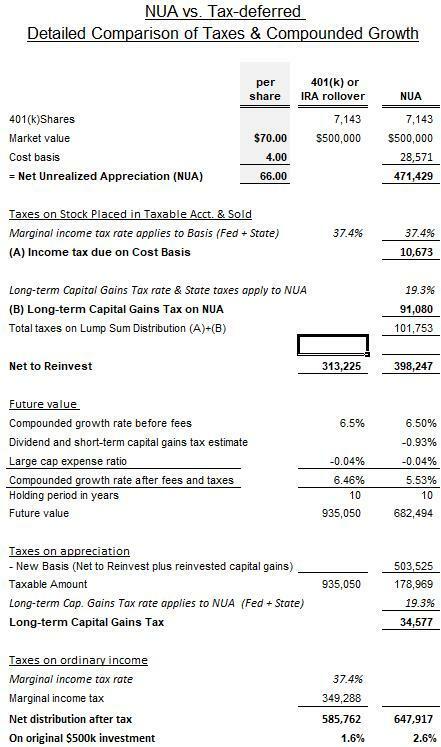 NUA’s tax advantage stems from lower long-term capital gains rates on the stock’s appreciation. By contrast, if the company stock is sold within the 401(k), the withdrawal is taxed at a higher income tax rate. In the example below, the income tax rate is in the 33% tax bracket which appears relatively high. Does it make sense to skip the NUA opportunity if you don’t need the money immediately? Leaving funds generated from selling company stock in a tax-deferred account (either a 401(k) or a rollover IRA) postpones taxes until the required minimum distribution at age 70 ½ (and then only a small amount). This provides a bigger capital base for growth than if the NUA strategy were used and, as we will see below, a higher rate of return on invested funds. Furthermore, if you delay withdrawals until later in retirement, your income may be in a lower tax bracket than now. But are these advantages enough to skip the NUA strategy? It turns out that the NUA strategy provided higher after-tax returns in nearly all cases when the funds generated from it were held for ten years. 1. Holding the funds in a tax-deferred account, completely withdrawing the funds and then paying income taxes. 2. Exercising the NUA strategy, paying taxes, reinvesting the proceeds in a taxable, non-IRA for ten years, paying dividend and capital gains taxes over ten years, and capital gains taxes at liquidation. 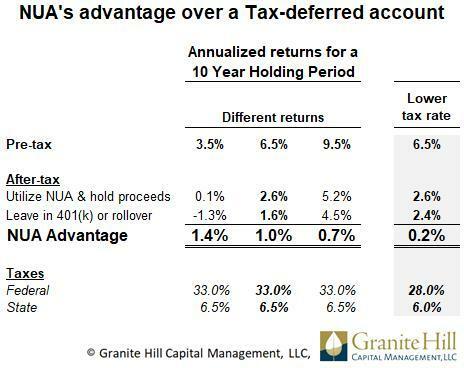 The after-tax NUA advantage, as shown in the table below under “Different Returns,” ranged from 0.7% to 1.4%. Pre-tax returns ranged from 3.5% to 9.5% determined the advantage. The largest NUA advantage of 1.4% appears in the left column below when pre-tax returns are 3.5%. This is expected. The NUA tax advantage from lower capital gains tax rates dominates. The larger capital base of a tax-deferred account needs higher market returns to overcome the higher income taxes at liquidation. Indeed, when pre-tax returns rose to 9.5%, higher returns on the larger capital base of the tax-deferred account reduced the NUA advantage to 0.7%. The far right column in the table below illustrates what happens with a decline in income. When federal tax rates fell one bracket, from 33% to 28%, and state tax rates decline from 6.5% to 6%, the NUA advantage was only 0.2%. Other assumptions: $500k in company stock ($70 per share x 7,143 shares), a $28.6k cost basis ($4 per share x 7,143 shares), a dividend yield of 2%, capital gains realized, taxed, and reinvested in a taxable non-IRA account each year of 5%. State taxes are assumed to be reflective of the New York, New Jersey, and Connecticut area. A spreadsheet at the end of this post summarizes the calculations for the 6.5% pre-tax return scenario. 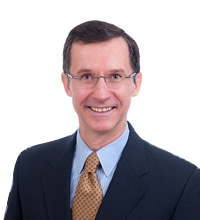 Annualized returns were calculated using spreadsheets provided in Integrating Investments and the Tax Code: Using the Tax Code to Enhance Returns and Add Value by William Reichenstein, CFA, Ph.D. and William W. Jennings, CFA, Ph.D. The investment characteristics were kept the same for funds generated from (1) utilizing the NUA strategy or (2) remaining in a tax-deferred account. In the taxable (non-IRA) account, the NUA proceeds were used to buy an S&P index fund. For the tax-deferred account, we sold the company stock and invested in the same fund. A detailed comparison of initial investment, taxes, and ending wealth appears at the end of this post. We varied the holding period length, returns, and tax rates. The sensitivity of returns to changes in the cost basis and the stock price was also reviewed. To be clear, we looked at only company stock in the comparison. The NUA strategy requires a lump sum in-kind distribution of company stock to a taxable account. It is not necessary to transfer all the shares: it is possible to take some shares in-kind and roll over the rest. If it is employed, other funds in your 401(k) are eligible for a rollover IRA. Doing so will postpone taxes and maintain tax-advantaged space for tax-inefficient investments. Tax advantaged space is important. Estimates of increased after-tax performance through judicious placement of funds between taxable and tax-deferred accounts range from .2% to .5%. See Investing in the Right Location: Tax Smart Portfolio Decisions. Did the NUA strategy ever lose to the option of leaving funds in a tax-deferred account? In a couple of scenarios it did. When the holding period lengthened to 20 years, the larger capital base of a tax-deferred account proved slightly more advantageous. Likewise, if income fell enough to drop the investor from a 35% to a 28% federal bracket, the tax-deferred account returns were slightly better. 1. Utilizing the NUA strategy reduces funds available for investment growth. Income taxes are paid on the cost basis of the stock. Lower long-term capital gains taxes are paid on the net unrealized appreciation. The combination of these taxes reduces capital available for growth. As the chart below illustrates, for our base case when the cost basis of the stock is quite low relative to the appreciation, income taxes take only a small slice. Capital gains taxes on the appreciation take a much bigger one even though the tax rate is lower. About $398k is left to reinvest. The tax-deferred account leaves nearly all the capital to appreciate in the future. We ignore the minimal transaction fees to buy a mutual fund. No taxes will be paid until funds are withdrawn, which we assume will be in a decade. 2. Utilizing the NUA strategy lowers investment returns. The stock market provides an annualized rate of return of 6.5% for the next ten years. This is consistent with Vanguard’s and JP Morgan’s capital market assumptions in the fall of 2016. Withdrawals occur at the end of 10 years. All dividends and capital gains are reinvested. 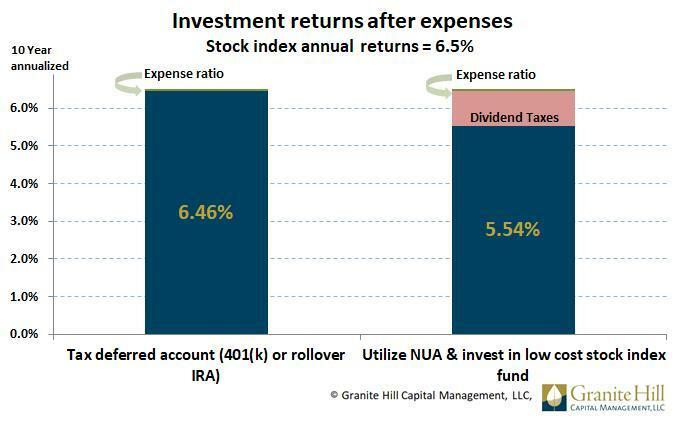 Both the NUA strategy and tax-deferred account invest in a stock index fund with an expense ratio of .04%. Dividends and capital gains in the taxable account funded by the NUA proceeds will be taxed. A 2% dividend yield is assumed. Capital gains are all assumed to be short-term and 5% are realized each year. Income taxes are paid on the tax-deferred account when all the funds are withdrawn in ten years. 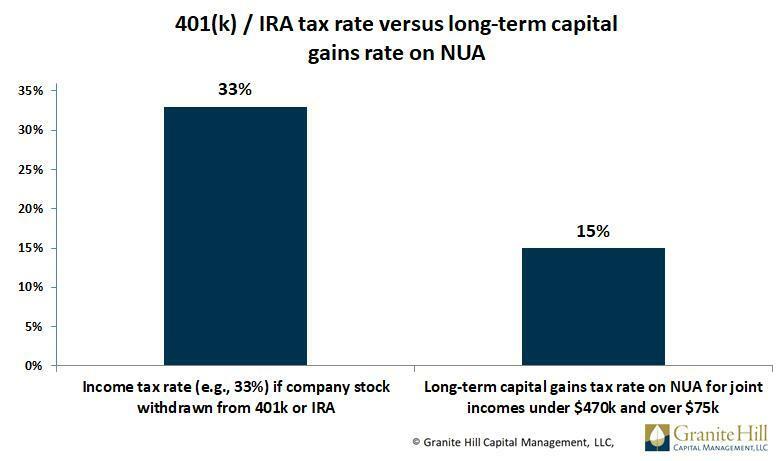 The NUA strategy provides greater wealth than the tax-deferred account despite a smaller capital base and lower investment returns. 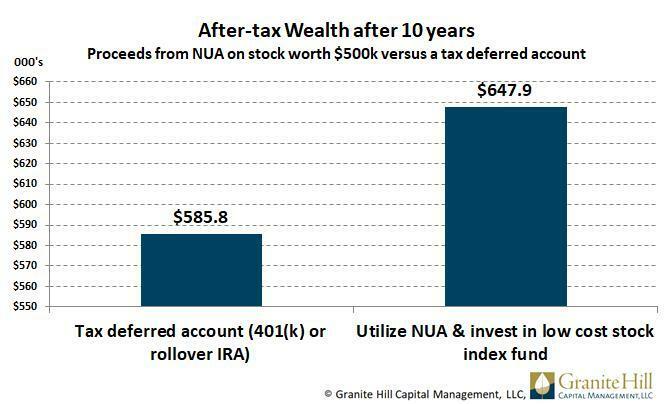 The 1% after-tax advantage of the NUA strategy when stock returns are 6.5% may not seem like much, but over ten years the compounding effect on $500k translates to an additional $62k ($648k vs $586k). Utilizing the NUA strategy is a slam-dunk for incremental returns on short holding periods in most scenarios. For long holding periods such as 20 years, the NUA strategy may not provide higher after-tax returns. Also working against the NUA strategy are income declines which may lower your income tax bracket. 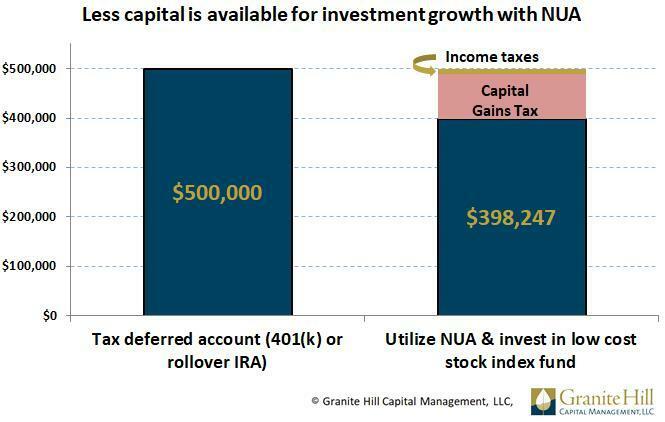 Finally, not considered in the NUA strategy analysis is the benefit of the index fund’s accumulated capital gains. They receive a step-up in cost basis when remaining funds pass on in your estate. In contrast, those who inherit your tax-deferred account will be required to take distributions taxed at their marginal income tax rate. Overall, there are many variables affecting the outcome of the NUA strategy in the short-term and long-term. Your unique resources and spending, market returns, and tax rates over the long-term are needed to judge the merits of this strategy. It is best judged in the context of a long-term plan. If you want to explore how NUA may work for you, give us a call or email.